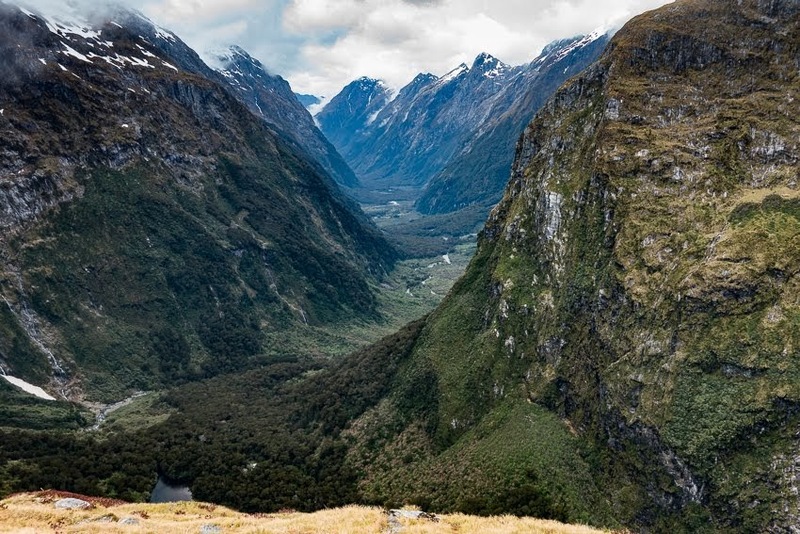 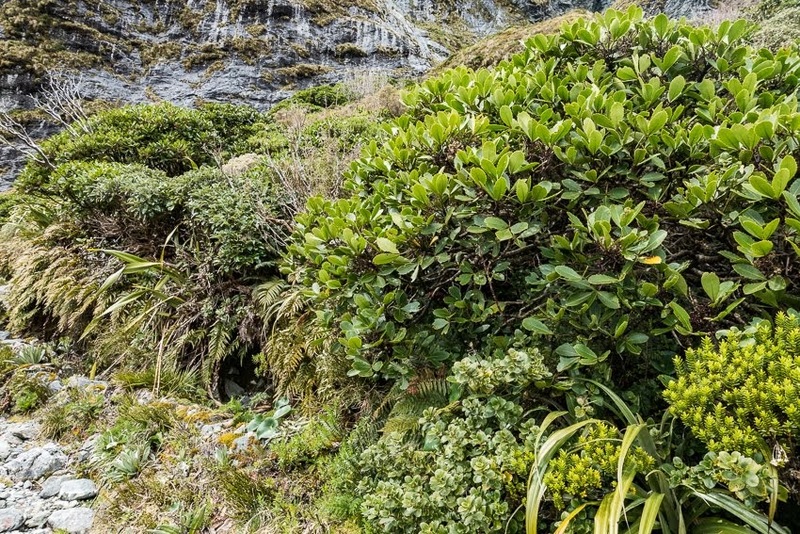 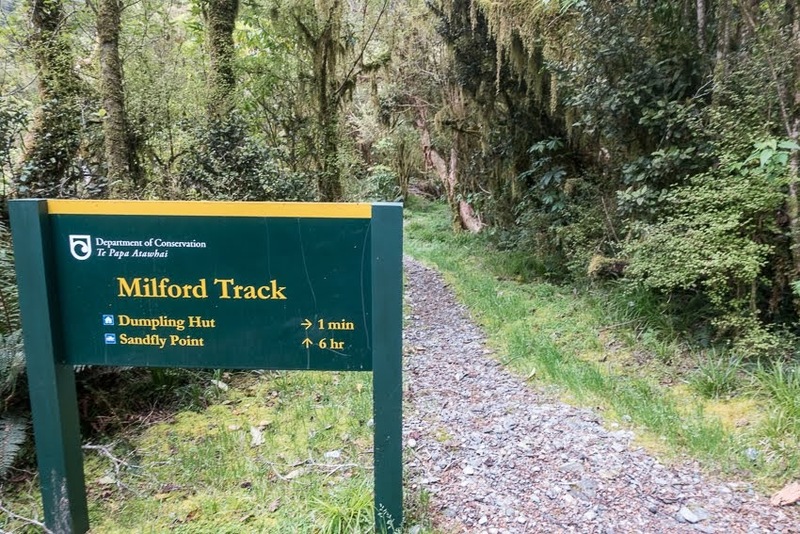 I had heard about The Milford Track decades ago. Well before NZ Tourism thought up the idea of Great Walks, being a series of iconic multi-day tramps that are heavily promoted internationally. As a result they routinely attract less experienced trampers so DOC have improved the track surfaces and provided better infrastructure. 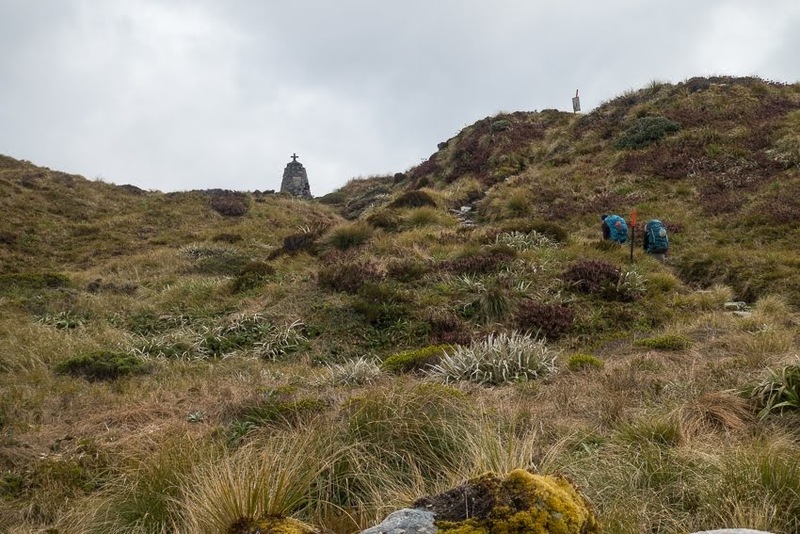 During the Great Walks season from late October until the end of April the huts all have resident wardens, and most have flush toilets and gas cook tops as well. That's about the extent of the luxury provided at a DOC Hut, though some of the tracks also have private lodges with bedding and hot showers for those who can't tramp without sacrificing even a few creature comforts. 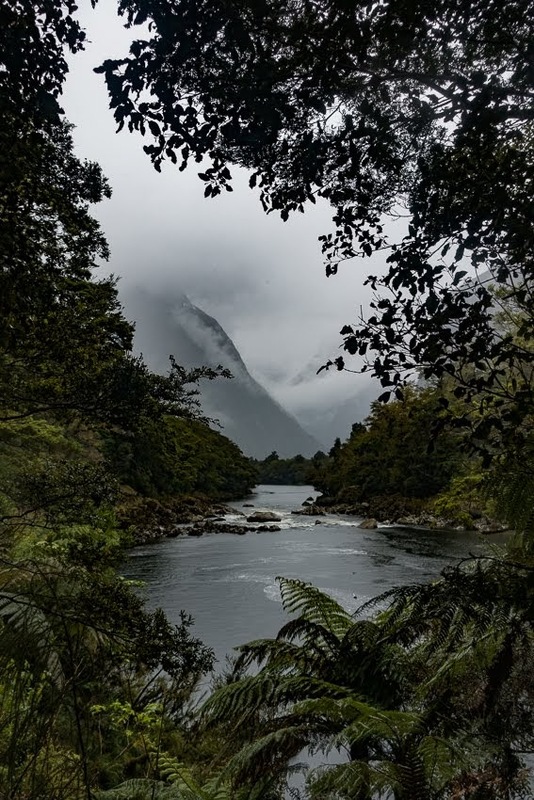 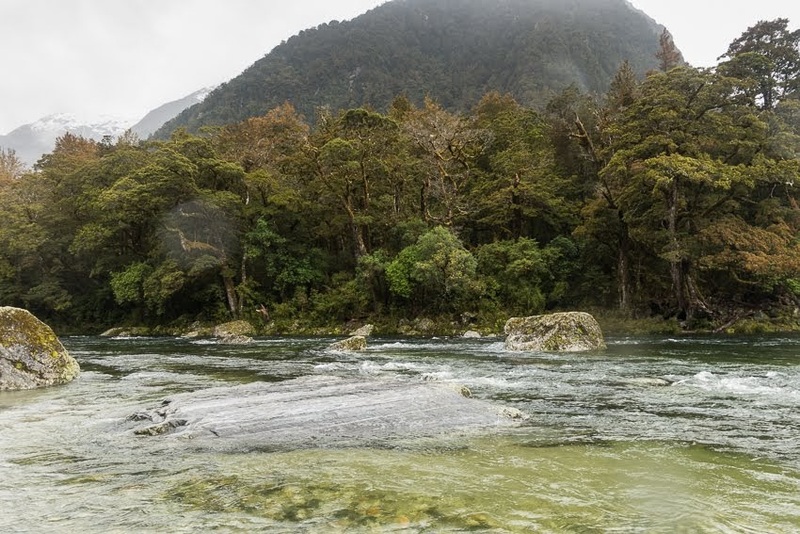 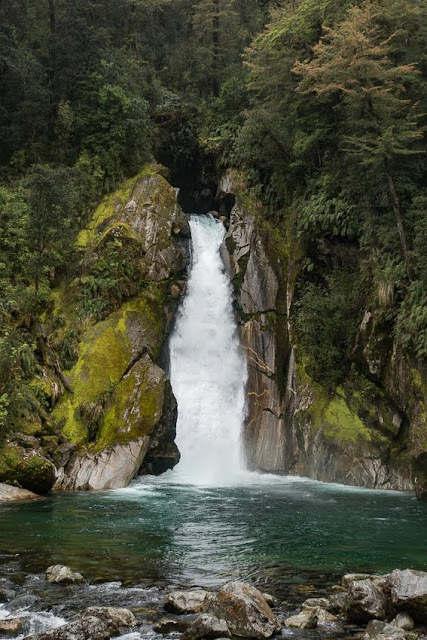 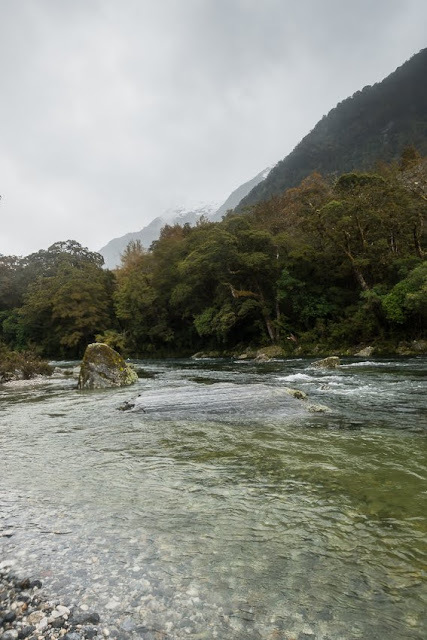 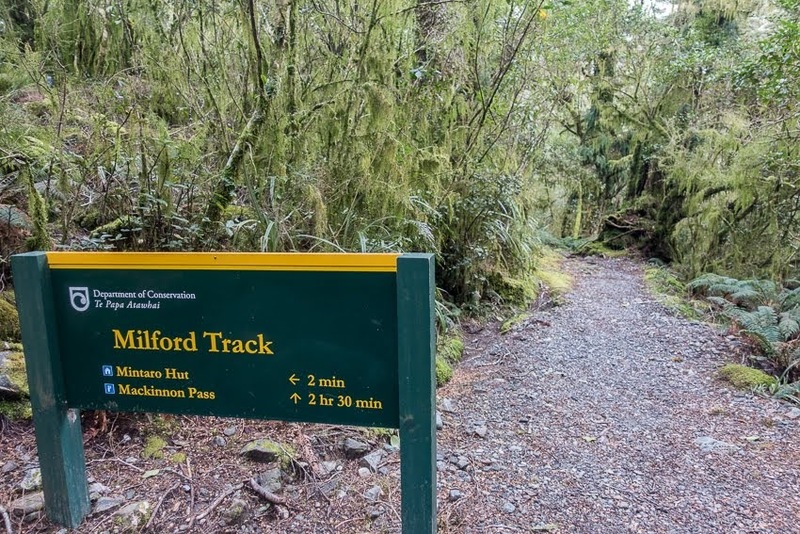 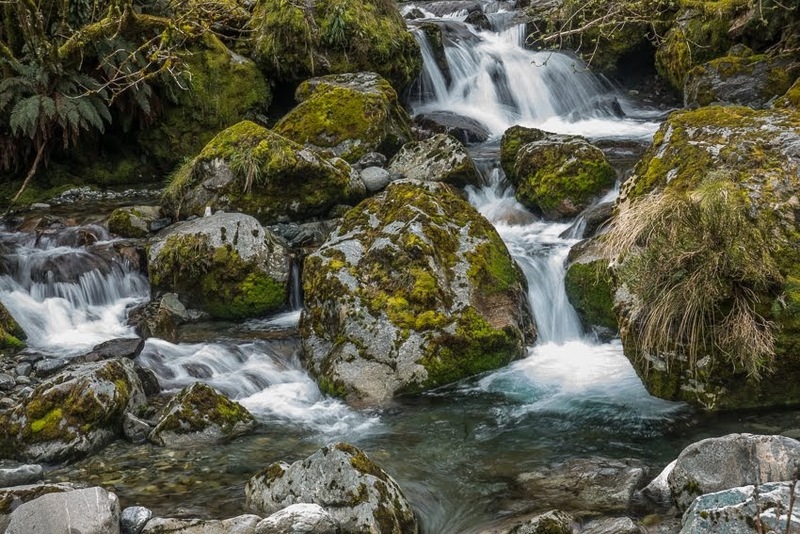 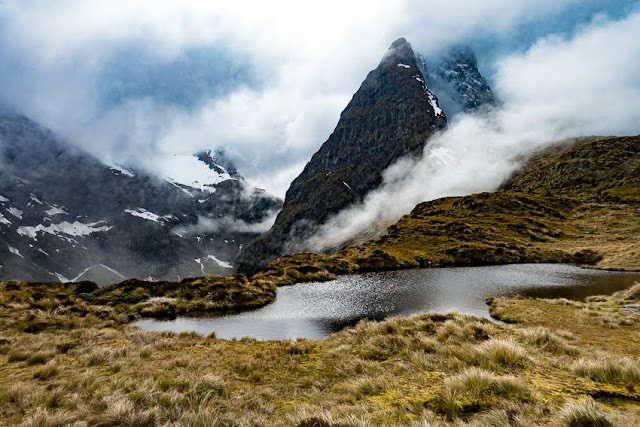 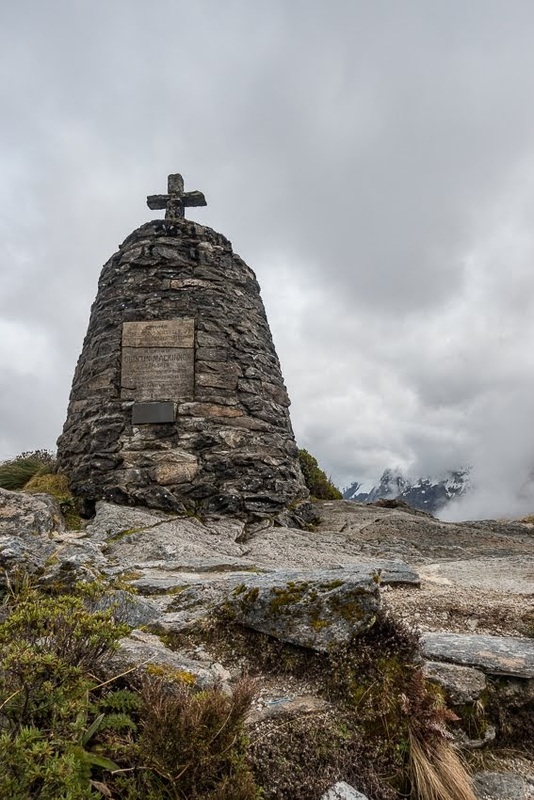 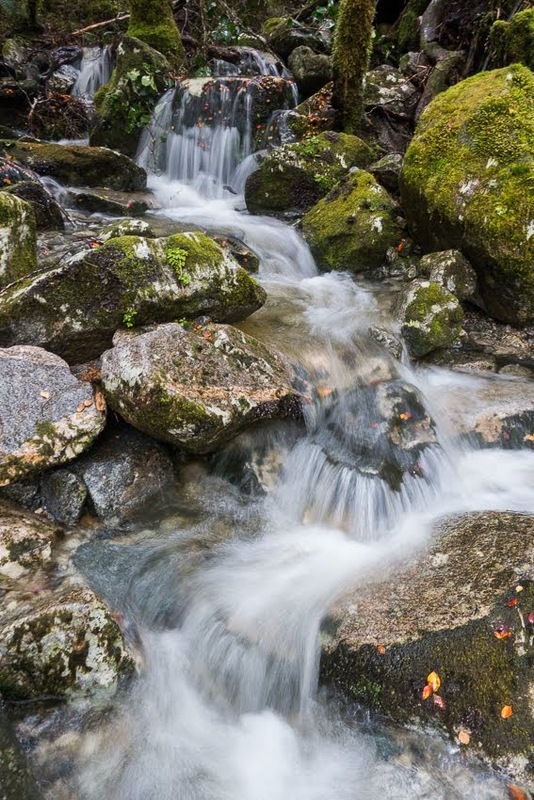 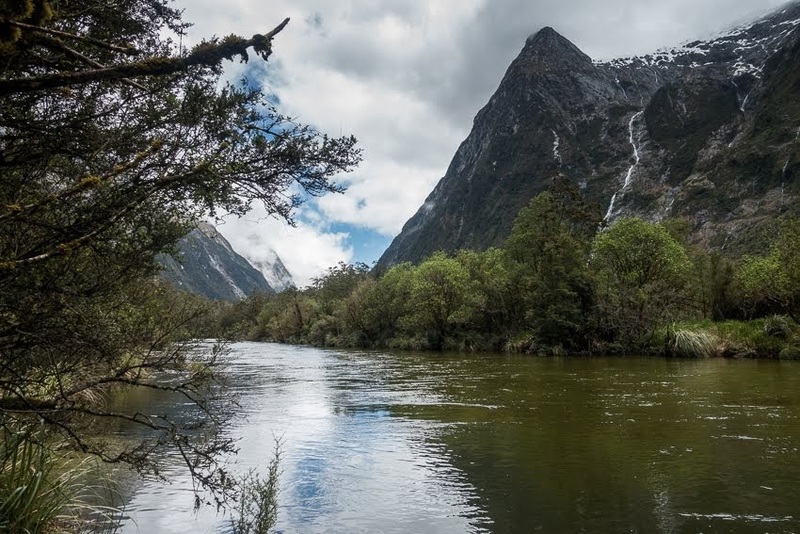 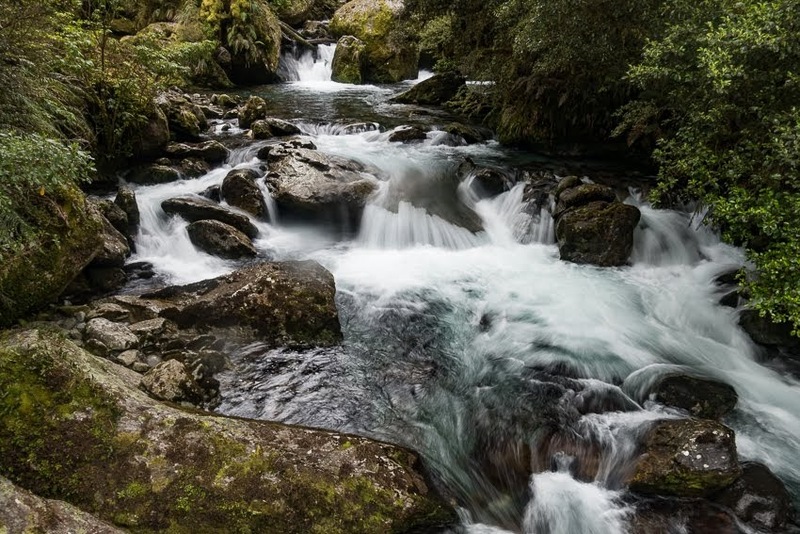 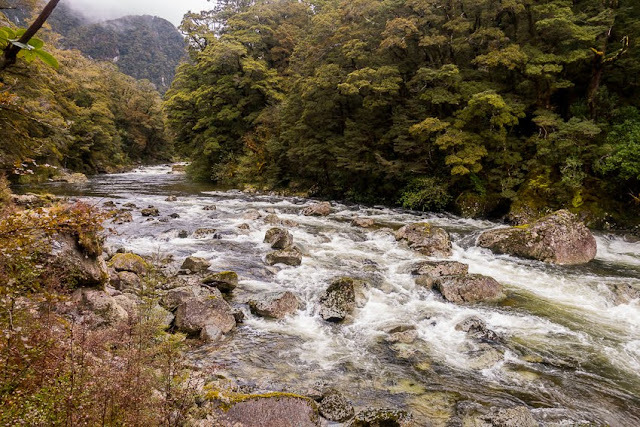 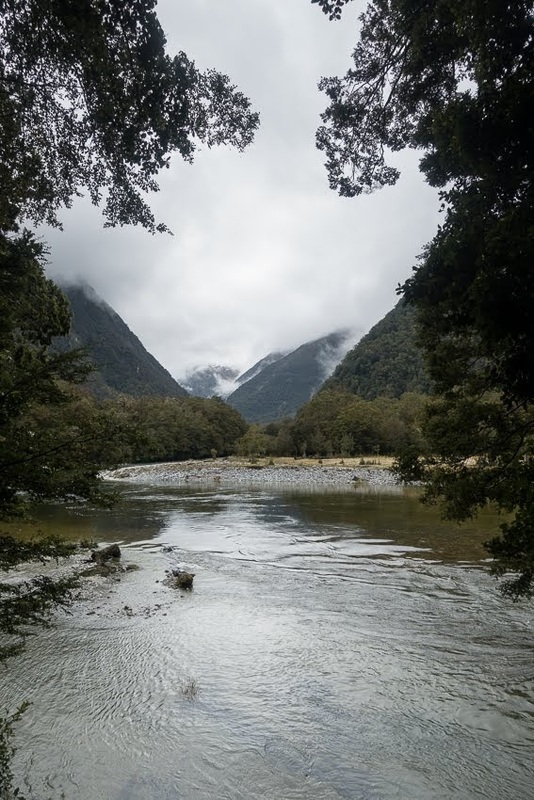 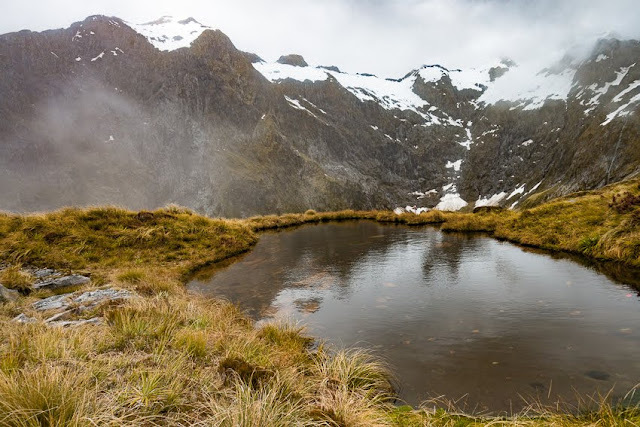 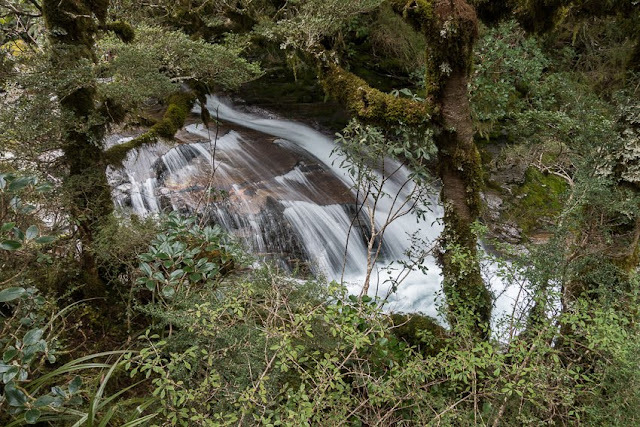 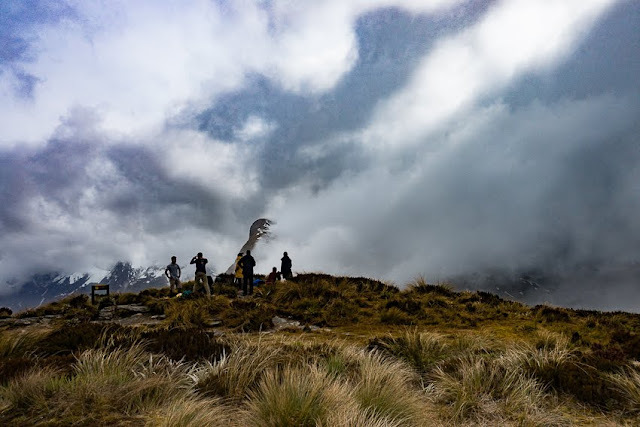 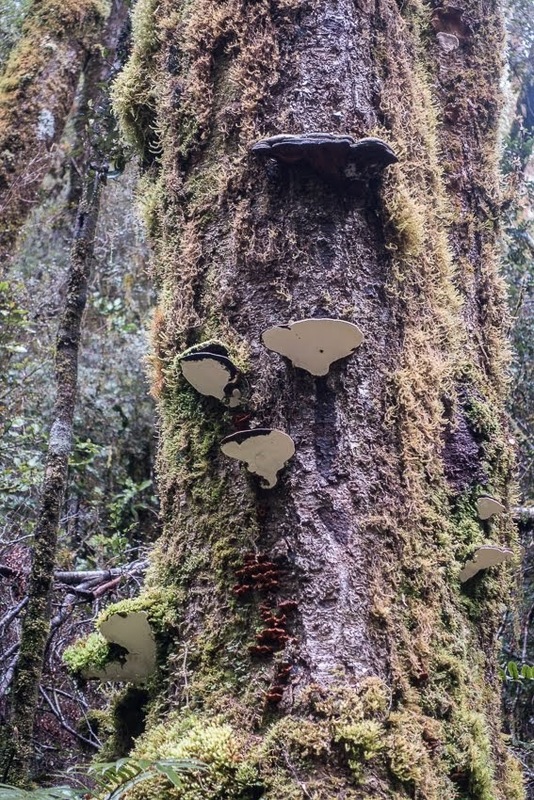 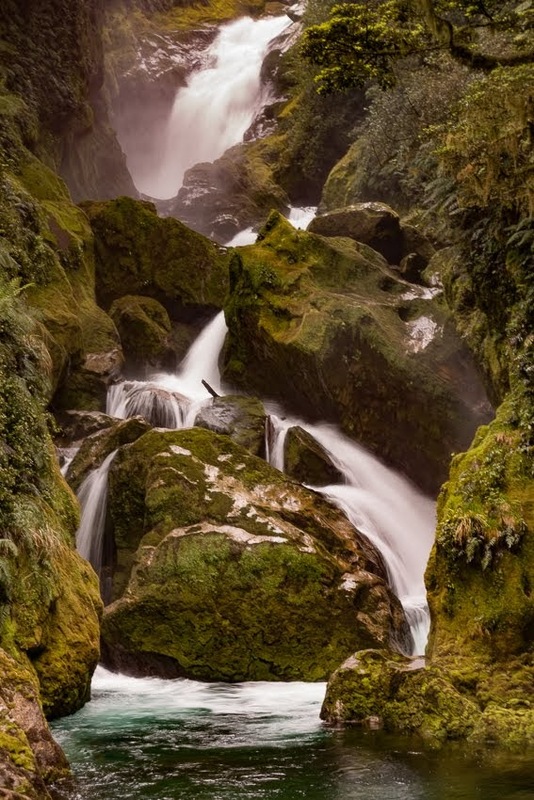 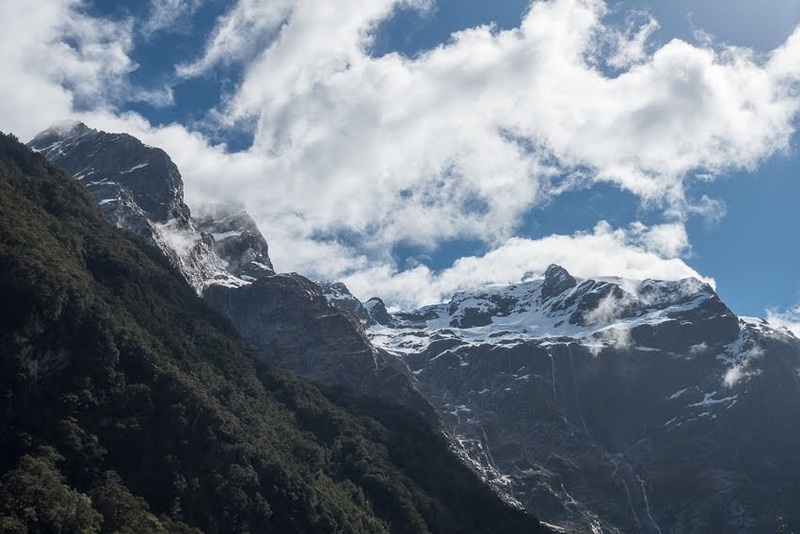 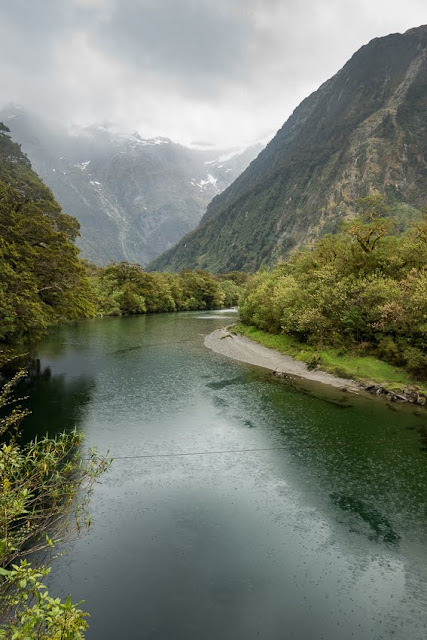 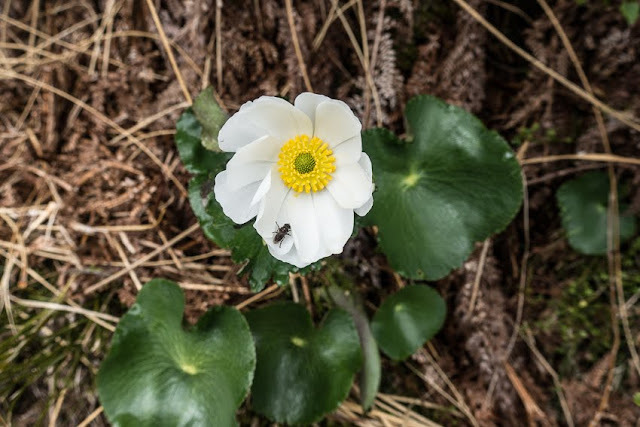 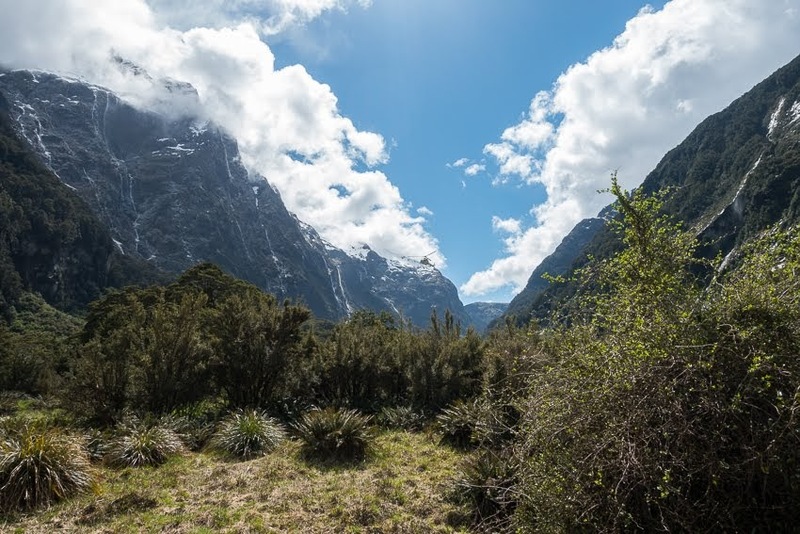 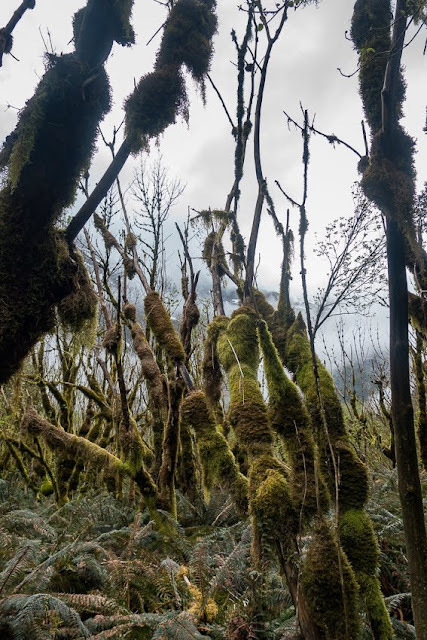 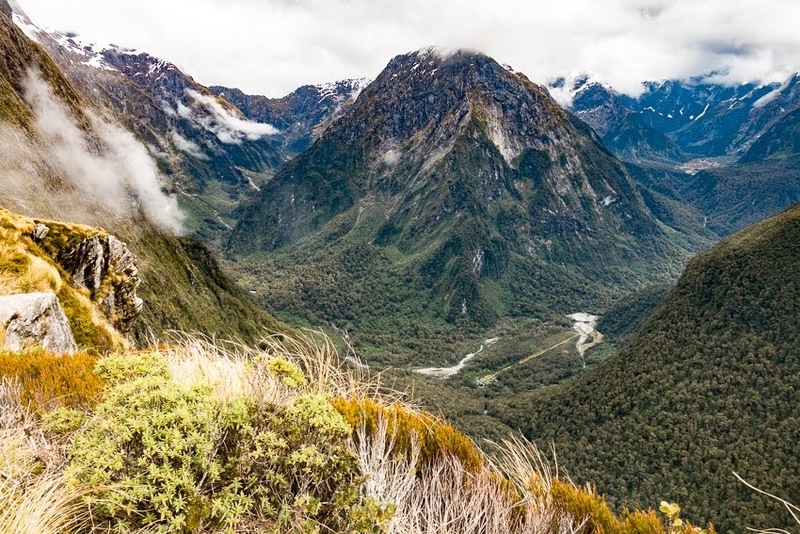 The Milford Track was developed in the late 1880s, and was a government run tourism venture guiding walkers between Glade House, on the northern shores of Lake Te Anau, to Sandfly Point at Milford Sound from 1901 until sold to private enterprise in 1990. 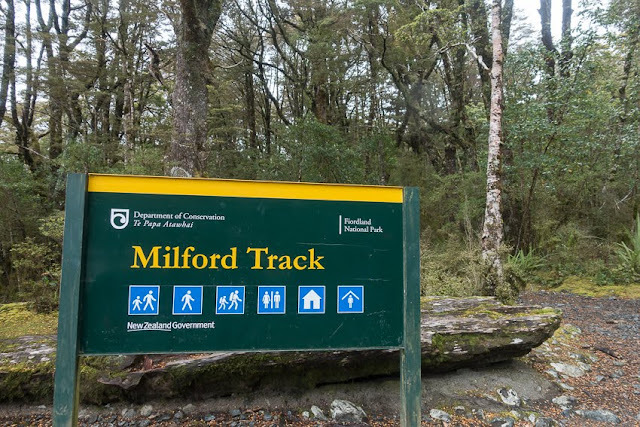 In the 1960s the track became open to independent walkers after considerable public lobbying, and separate huts were built to accommodate them. 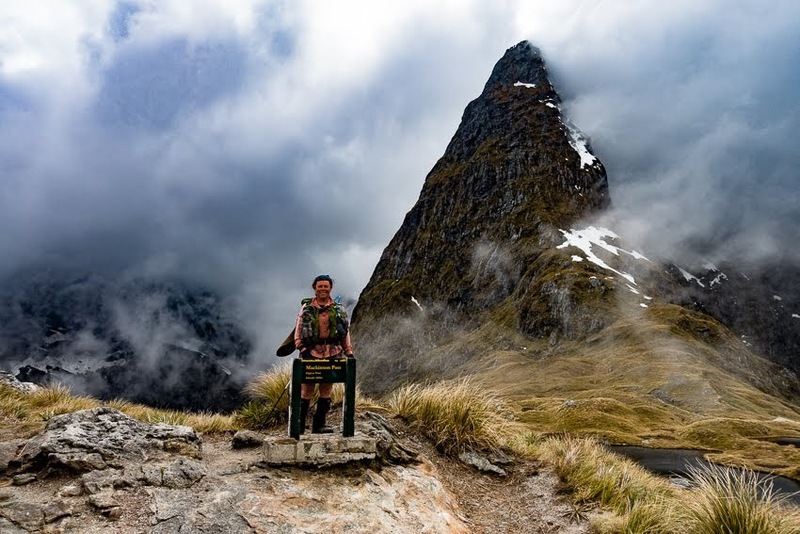 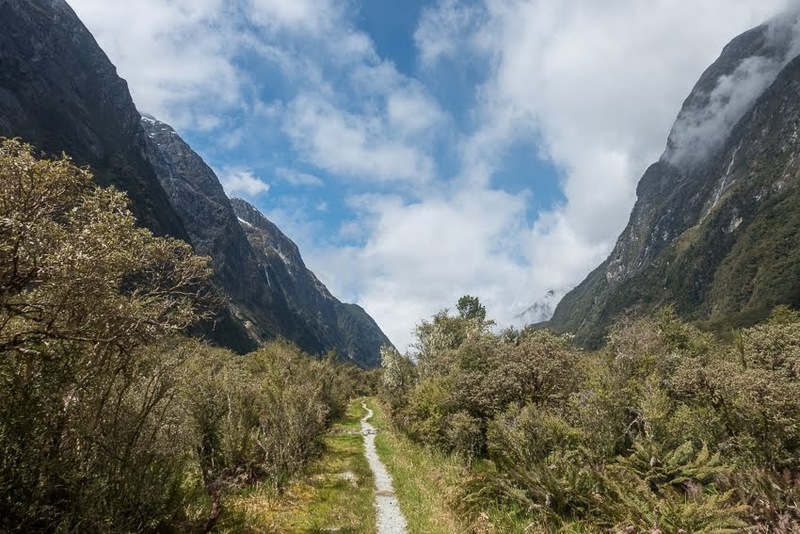 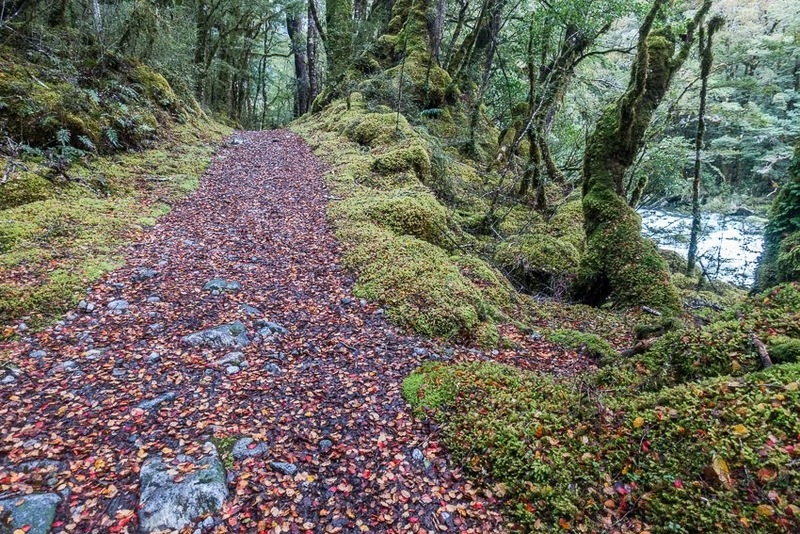 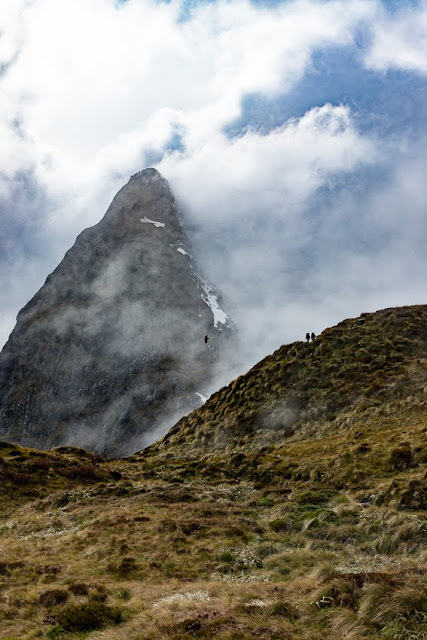 Until the road from Milford Sound was built in 1954, walkers had to return the way they came. 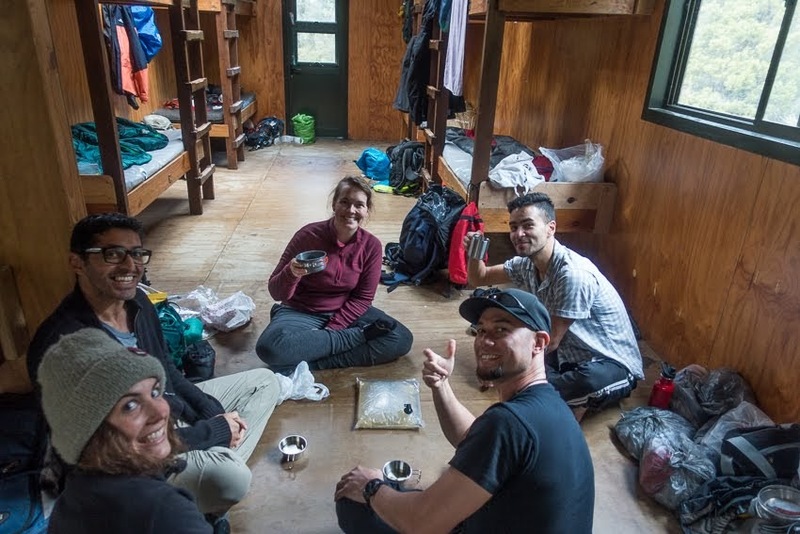 These days you either pay a bit over $2000 to do a private guided tramp complete with meals, daily hot showers and a real bed to sleep in, or book your single bunk bed at a DOC hut as soon as the bookings for the following season become available in mid June each year. On the Milford Track that's $70 per night, or $140 for overseas visitors. Usually, the Milford is booked out solid, but I decided to check the DOC website and see if there was a spare bed available. 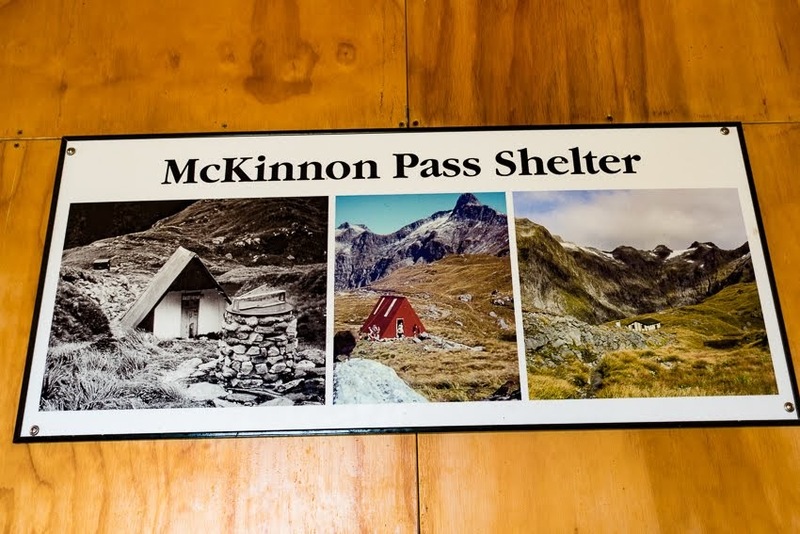 Due to a wee earthquake somewhere close to Mintaro Hut whilst I was out on my west coast tramp there seem to be a few spots available. 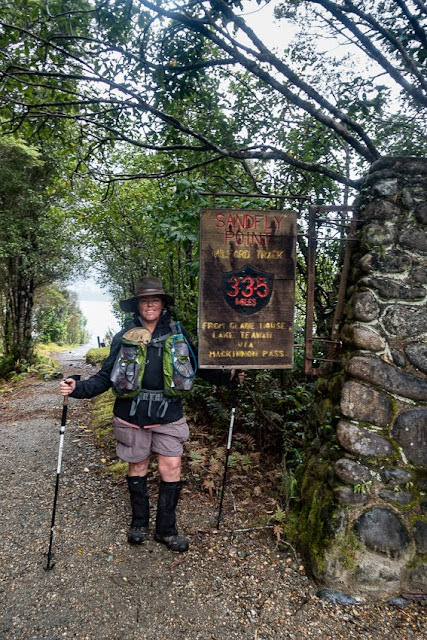 I check the weather forecast to make sure I'm not signing up to 3 days of rain, then book my spot. 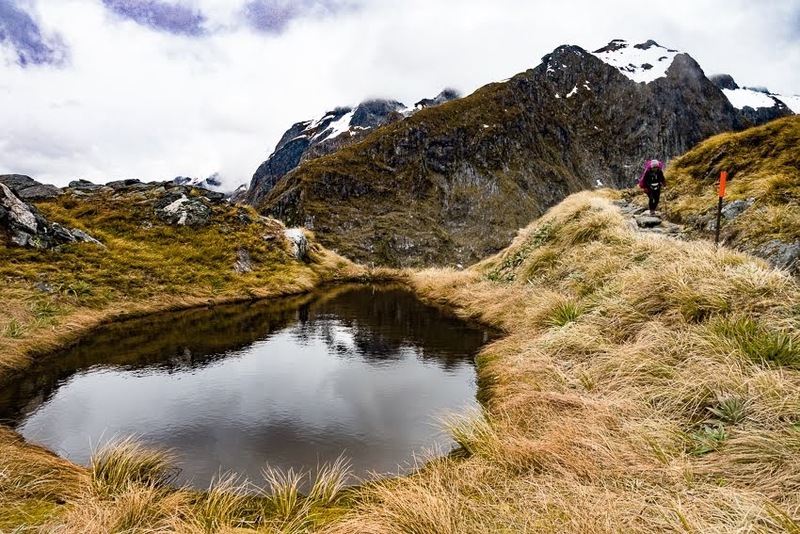 I have stayed put in Wanaka until Labour Day weekend, as my flatmate has been on a tramp on Stewart Island and I offered to look after the house and garden until her return. There hasn't been a lot of impetus on my part to get away sooner, as late large snowfalls, followed by warm weather, have made much of the alpine terrain very dangerous due to high avalanche risk. 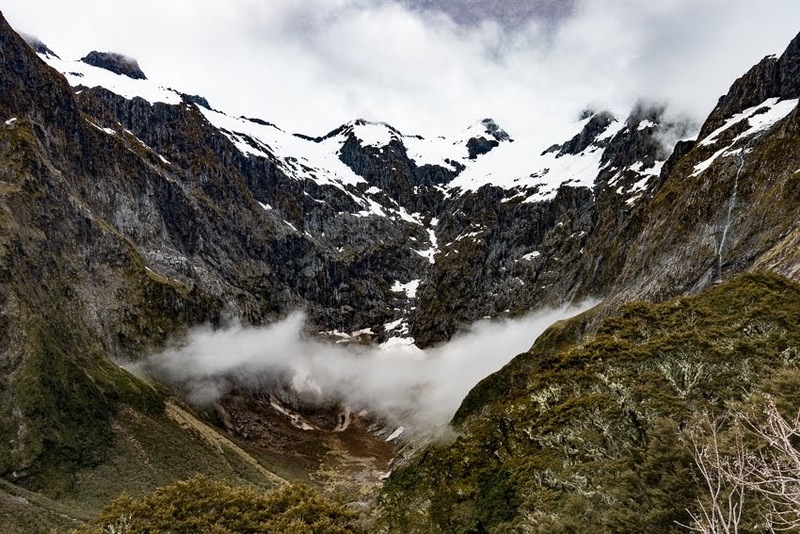 The whole Southern Alps is one big wet snow slab ready to slide. 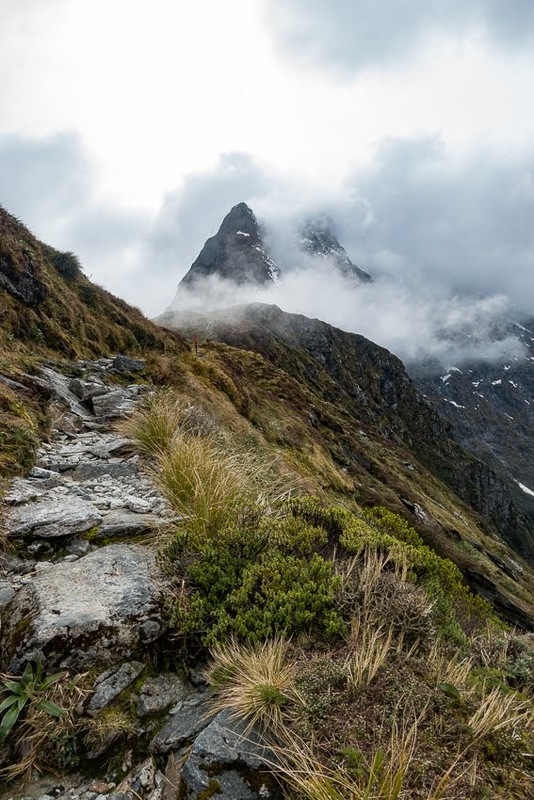 There are fatalities in the Mt Cook area and near misses in Fiordland over the next few days so my caution is warranted. 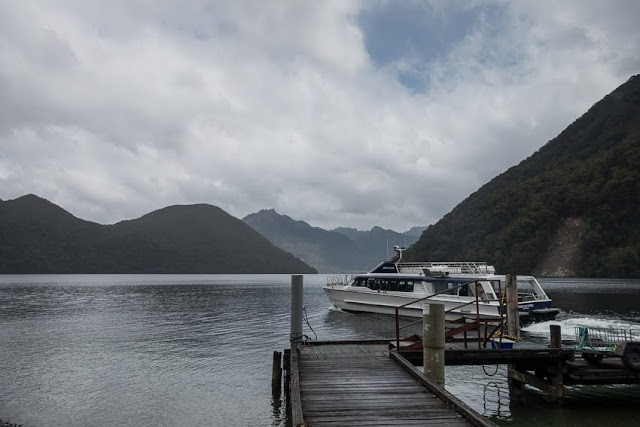 At Te Anau I pick up my tickets at the DOC office then catch a bus up to Te Anau Downs where I board a ferry for the ride up to the head of Lake Te Anau where the track begins. 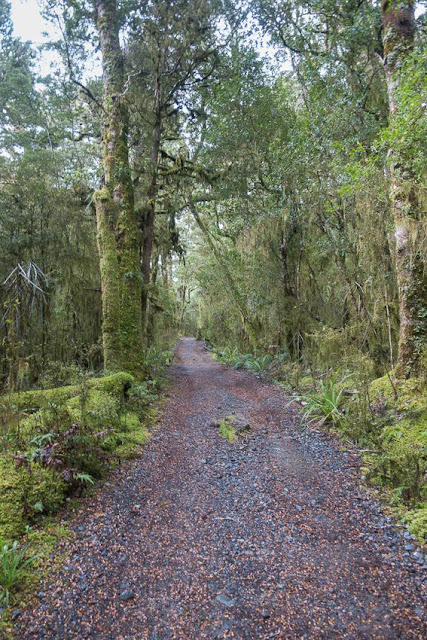 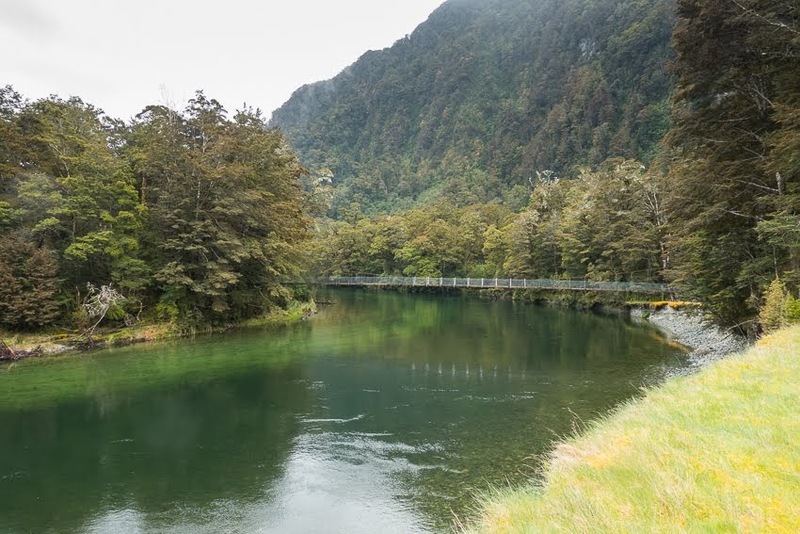 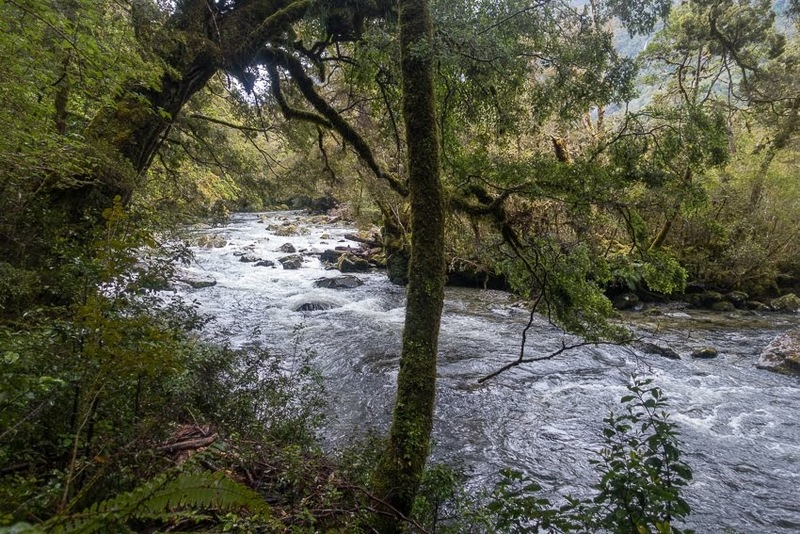 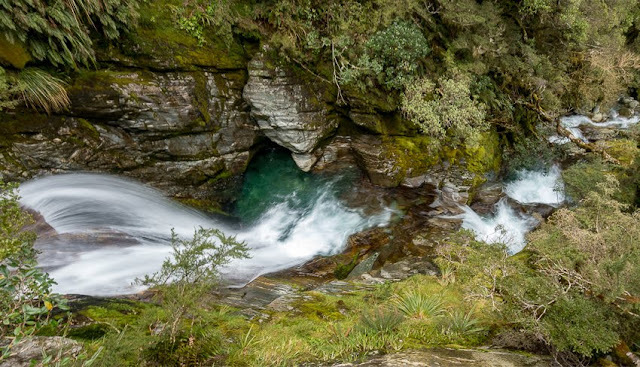 Transport costs for walking the Milford Track add considerably to the venture as it is by no means a loop track. 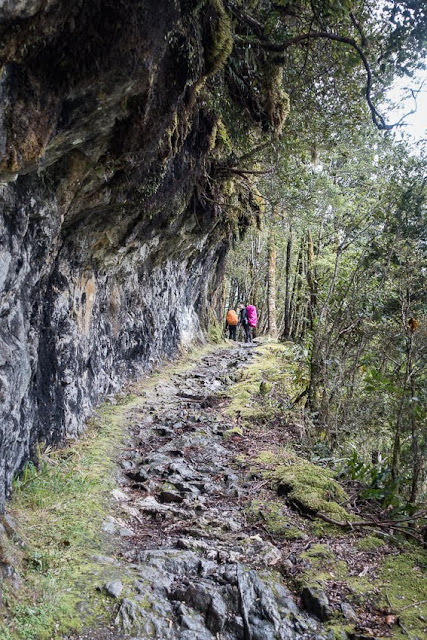 The advantage of being so inaccessible is it's actually much easier to control numbers on the track, but it also limits revenue, and the costs of maintaining and staffing The Great Walks outstrip the income from tourists. Hence the recent price hike. 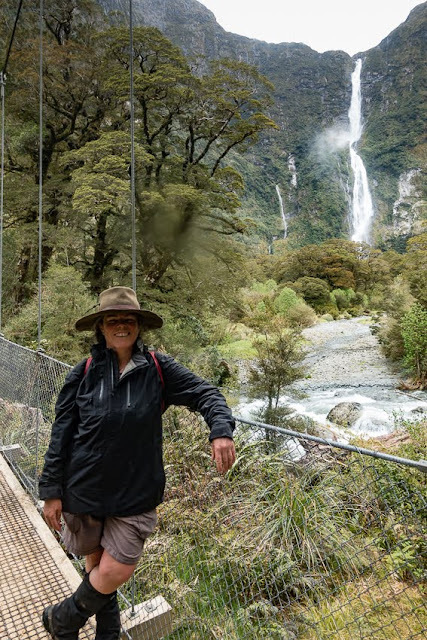 At the wharf everyone takes the obligatory picture then heads off along the track. 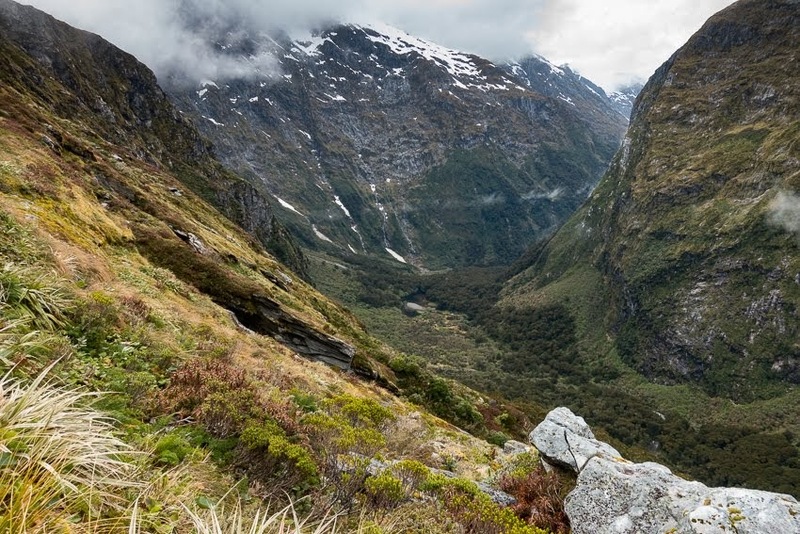 I wait till everyone has left and begin my own slow meander, past Glade House, the first of the private lodges, not yet open for the walking season, and on up the Clinton Valley to Clinton Hut. It's an easy, well maintained gravel path following the river upstream. It's only an hour and a half walk to Clinton Lodge, where we stay our first night. Being the Milford Track the Hut is large, has gas cookers for us to use and solar lighting in the kitchen, but otherwise has the usual bunks and outside toilets (though flushing ones not a long drop) of other DOC Huts. 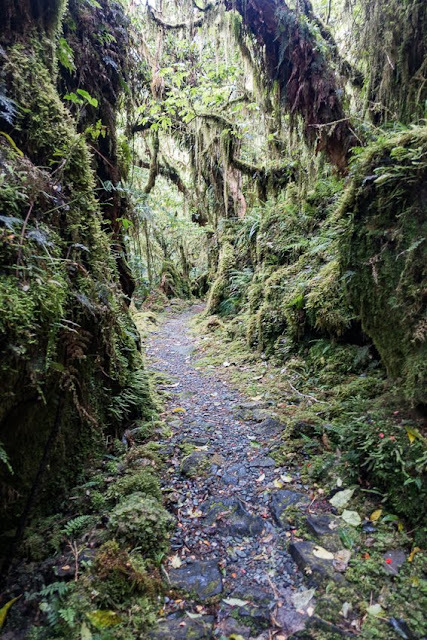 Our warden Ross takes us on a nature walk late afternoon where we learn about the local flora and fauna, and we all get to know each other. The Hut isn't full as there have been some late cancellations, but it's certainly the most people I've seen on a tramp for a while. The next day we head further up the Clinton Valley. 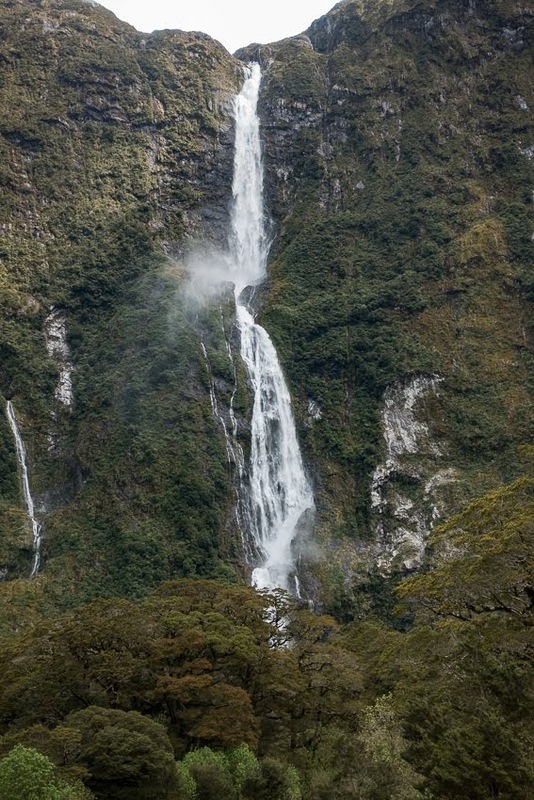 It narrows further and each side we are hugged by sheer cliffs with myriad waterfalls. Up above there is still a lot of snow, and because of the poor weather recently, not all of the bridges have been replaced on the track. 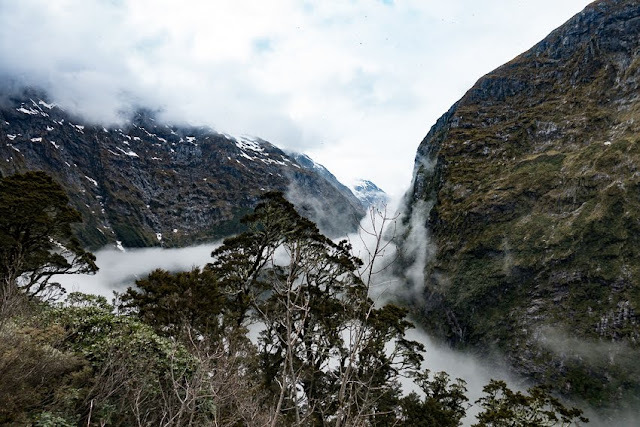 The upper Clinton Valley is prone to avalanches coming down over the cliffs into the valley, and damaging the bridges over the streams, so DOC takes the bridges out over winter and replaces them again for the start of The Great Walk season. 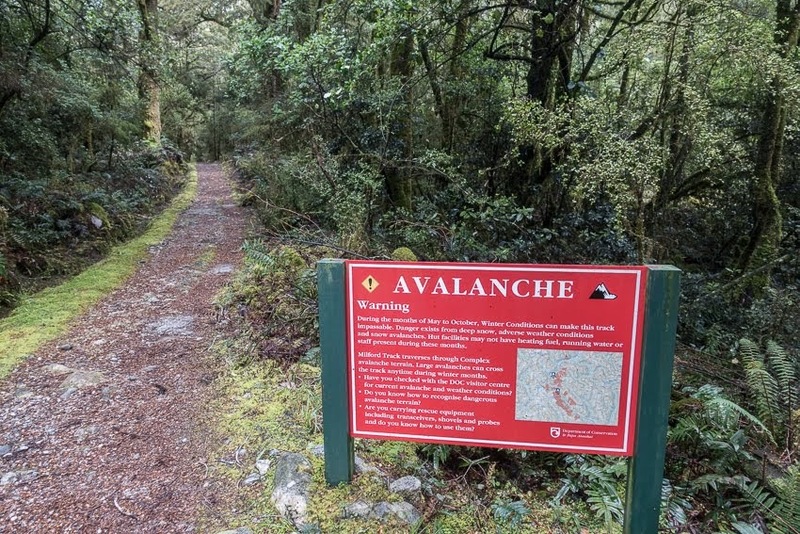 But the avalanche specialists hadn't been able to get up high on the snowfields to dig pits and analyse the snow pack, so they hadn't yet deemed it safe for us to walk this section. 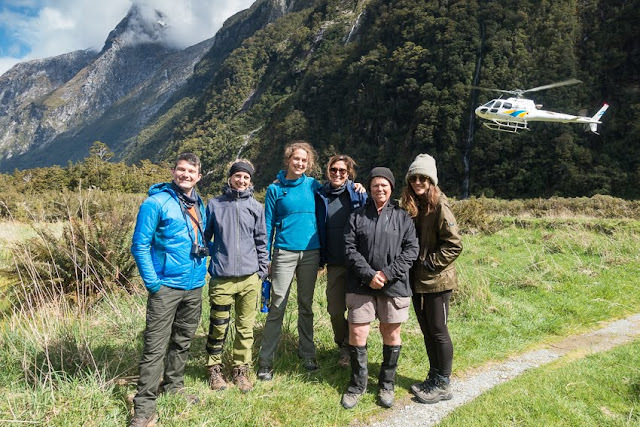 So we flew from Prairie Flat to Mintaro Hut in a helicopter! After they had ferried us all up to the hut, the weather cleared and they were able to do their assessment, and to replace all the bridges. 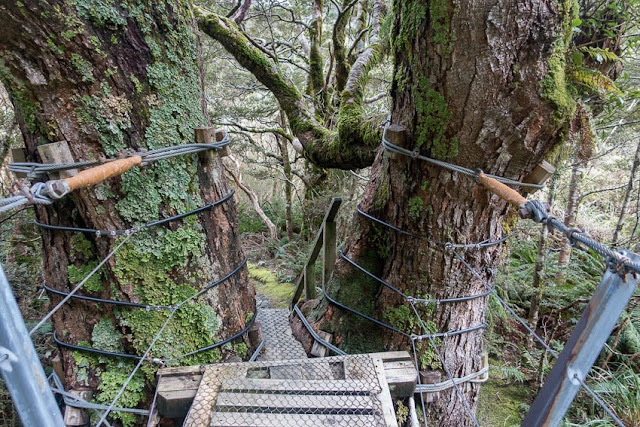 I'm ambivalent about whether I would have preferred to have been able to walk the second section, but the chopper ride was pretty good as well. It also gave us time to head up to Mackinnon Pass for good views. 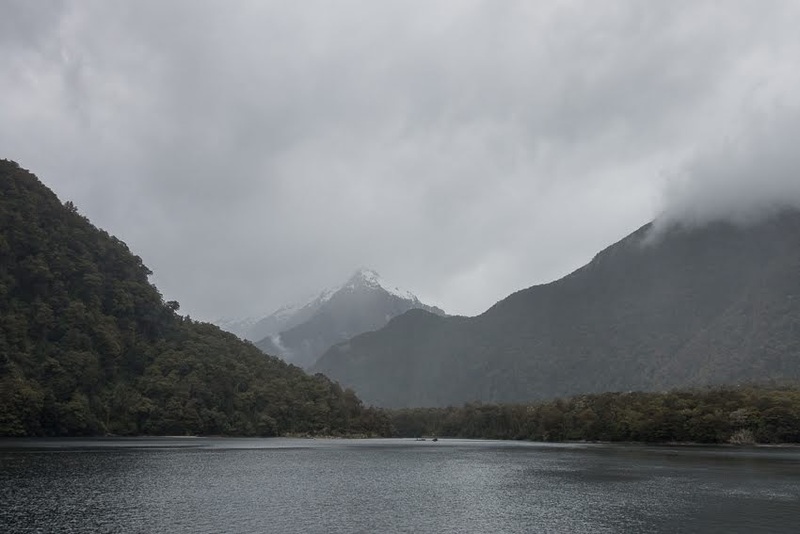 I figured the weather would still be good the next day so elected not to. 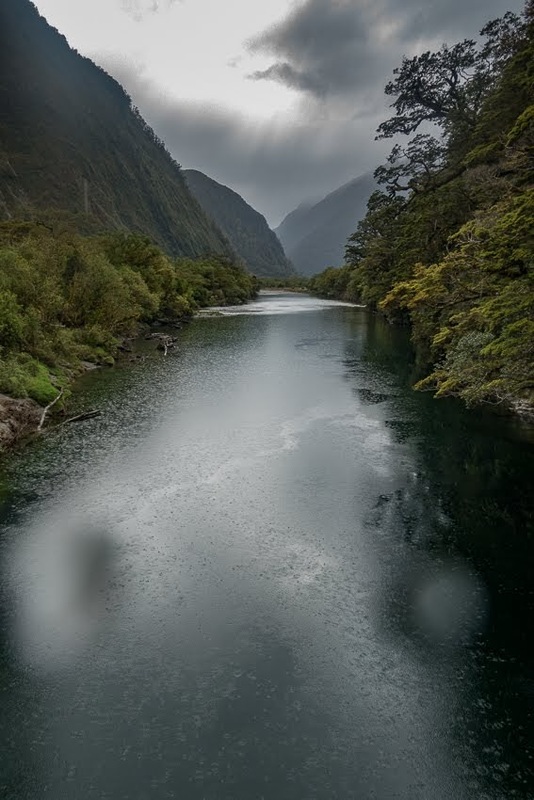 Day 3 dawned cloudy. 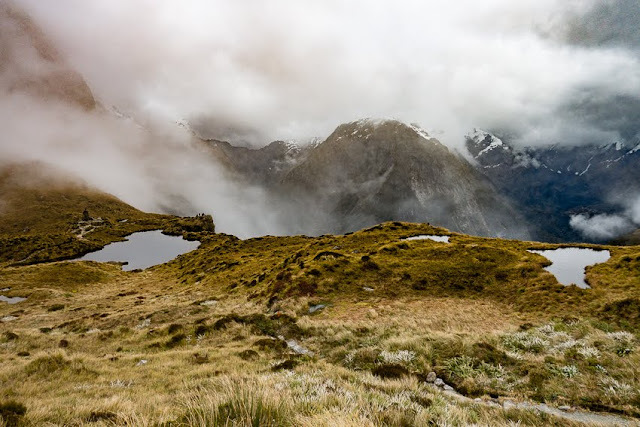 Some of the crowd had left before dawn to see sunrise on the saddle, but only got mist and fog. 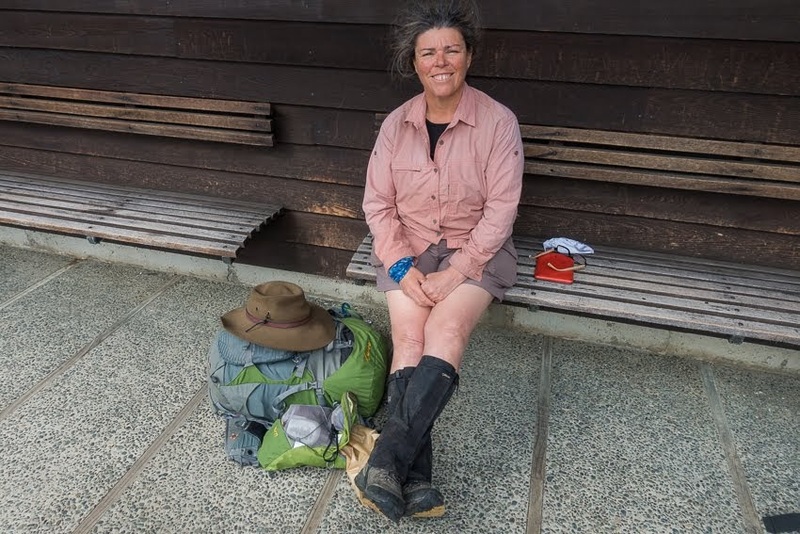 I, as usual, was last to leave, but still managed to catch up to some of the others. 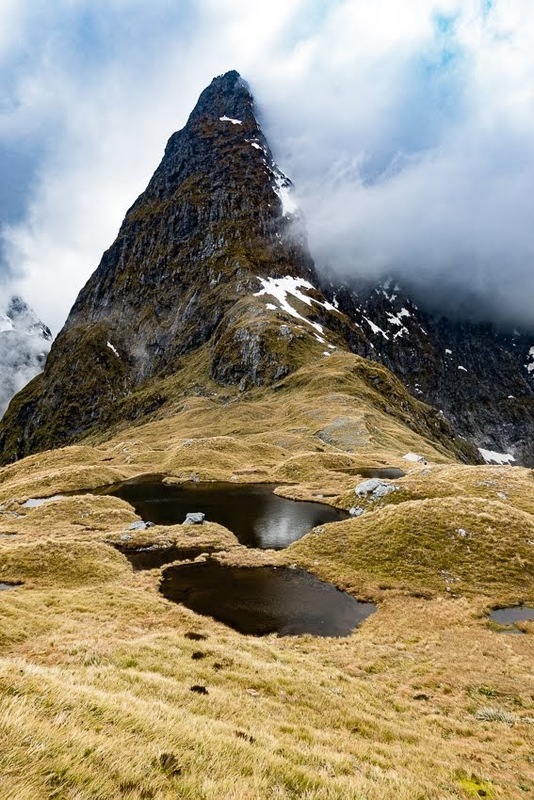 The Pass was clear when we arrived, although cloud came and went, so there were still good views in all directions. 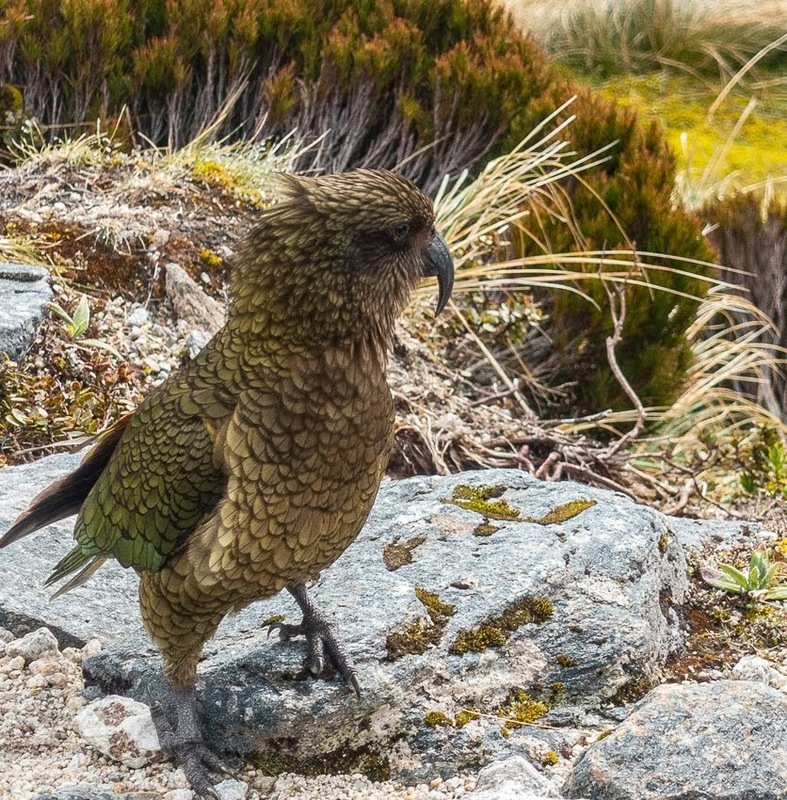 Kea hung around ready to steal anything left unattended, and small tarns dotted the alpine landscape. There's a shelter up on the pass, complete with a gas cooker, so it's a good spot to stop for a cup of tea before descending the other side. 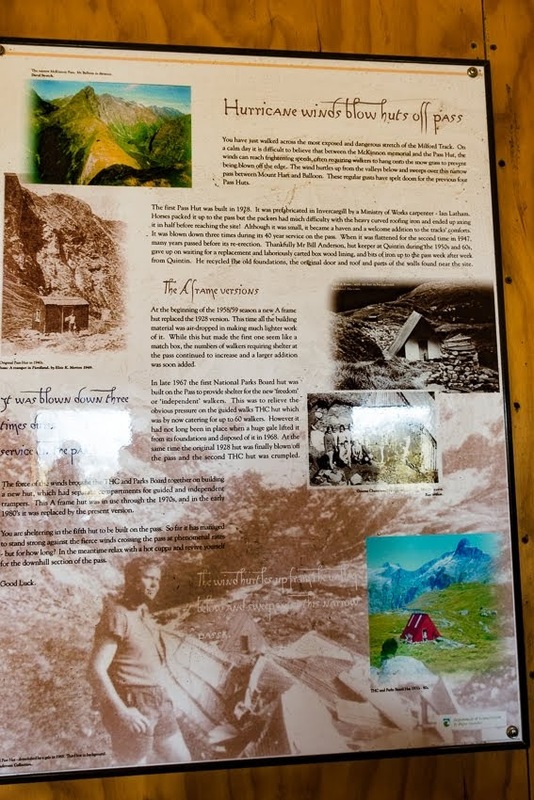 This shelter is very exposed, and has had to be replaced a few times over the last 100 years. 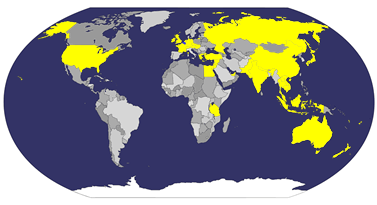 The current shelter dates to the 1980s. Down the other side is more protected, and suddenly you find yourself amongst flowering alpine plants in what seems like a garden rockery. Lower down you cross Moraine Creek and then follow this creek down via steps and boardwalks, enjoying the cascades as it thunders between huge rocks on its way down to the valley floor. 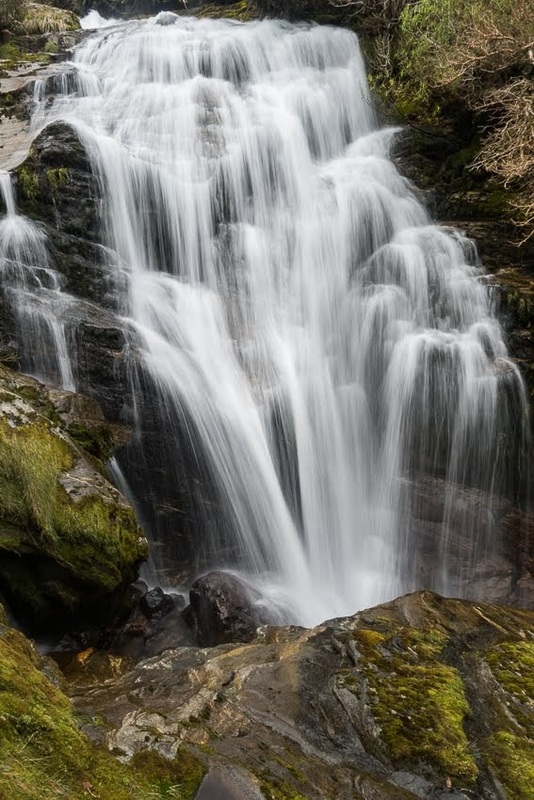 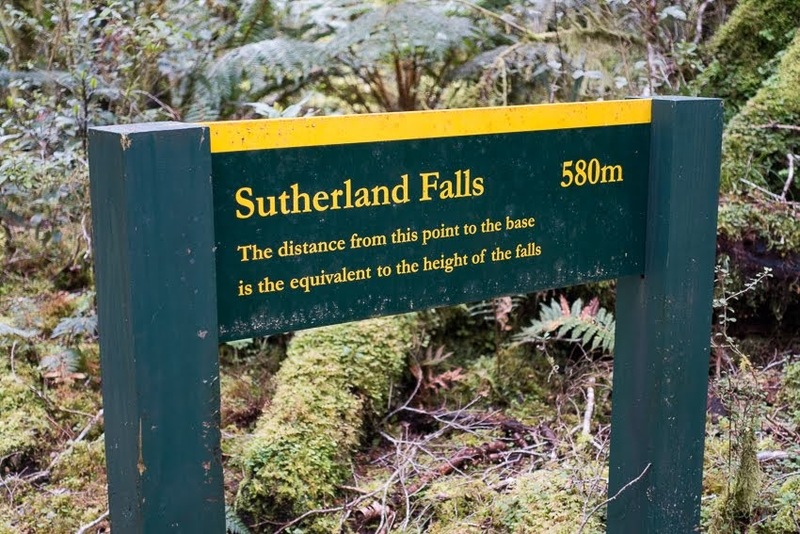 Once down into the Arthur Valley, there's a detour to Sutherland Falls. 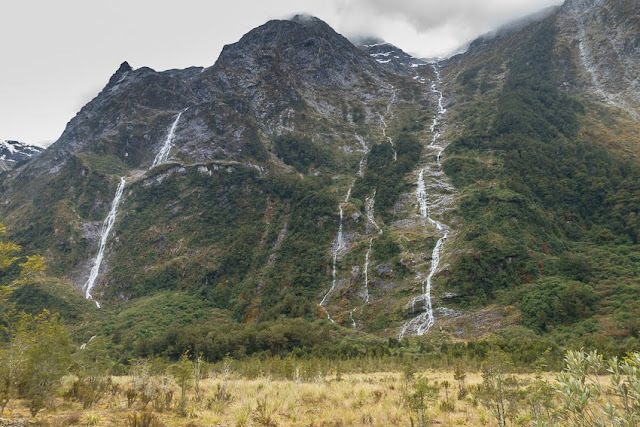 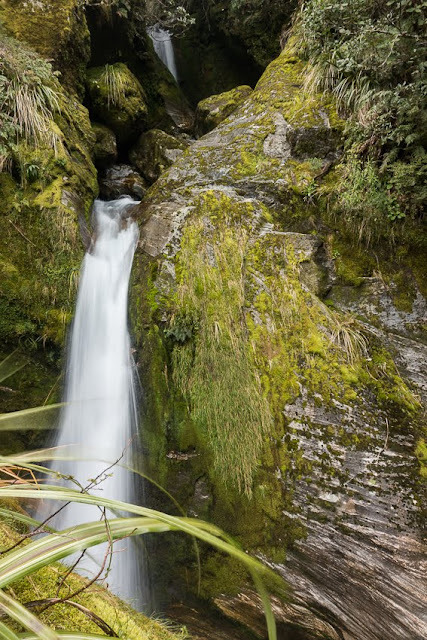 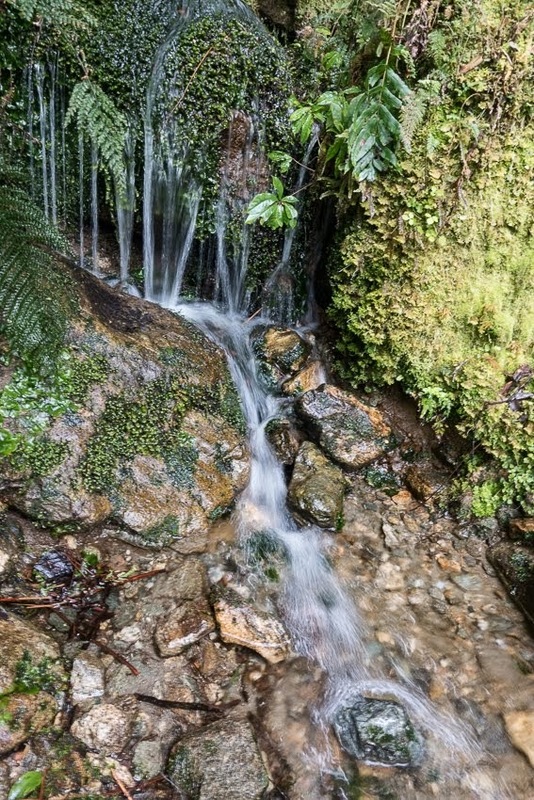 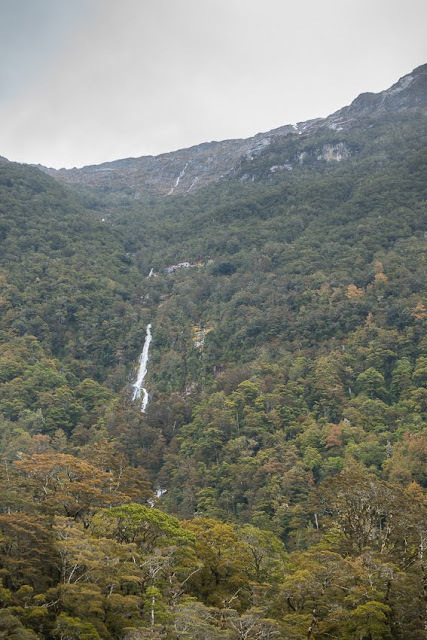 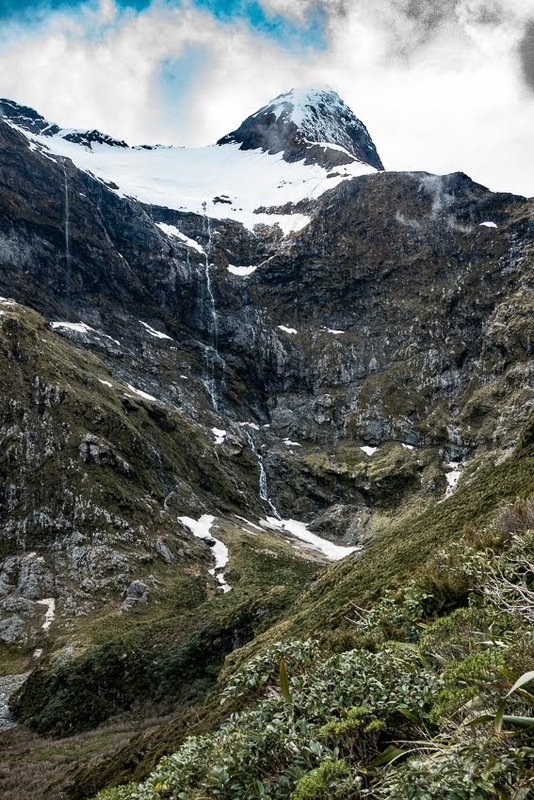 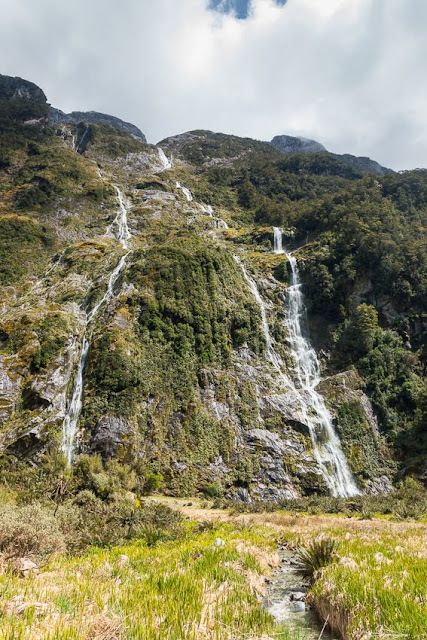 This is the longest waterfall in New Zealand, falling over two drops from a glacial lake above. In Spring, with snow melt at its peak, it is absolutely pumping, and impossible to get near without getting completely drenched. 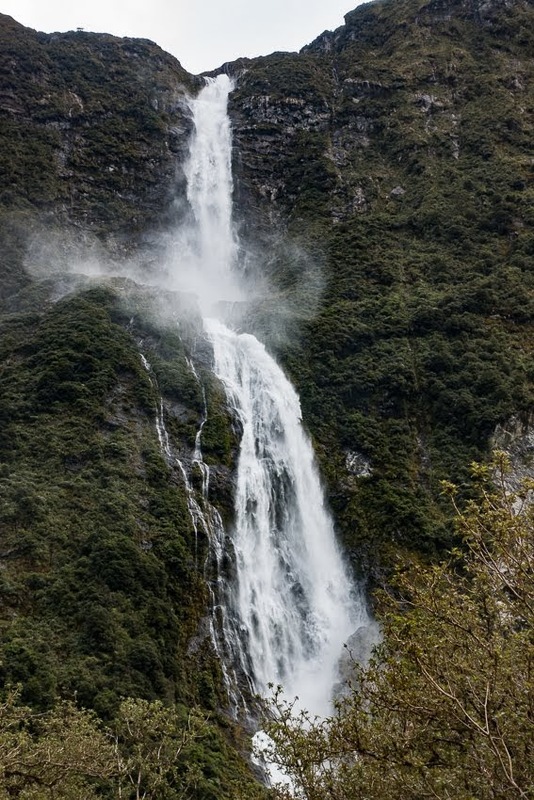 Late summer, when the flow is lower, it's possible to walk behind the waterfall, but right now, that would be suicidal!! 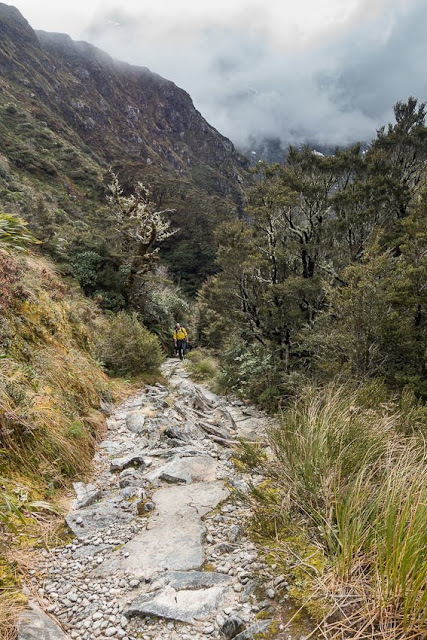 The final walk down to Dumpling Hut is pretty easy, as is the rest of the walk down the Arthur Valley the following day. 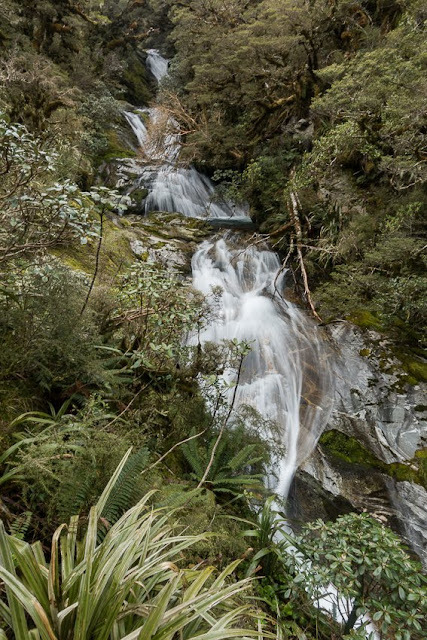 There's a nice waterfall or two, and it's really noticeable from the vegetation that the rainfall is much higher on this side. 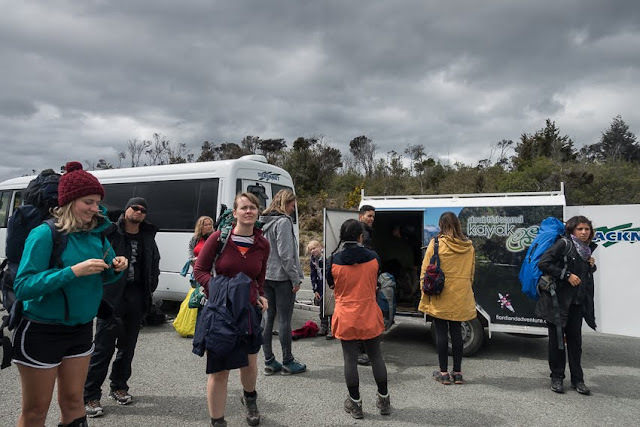 At Sandfly Point we are surprised NOT to be welcomed by the eponymous creatures, and await our boat ride across Milford Sound to the ferry wharf. Here we hit the cafe for a beer whilst waiting for our buses back to Te Anau. 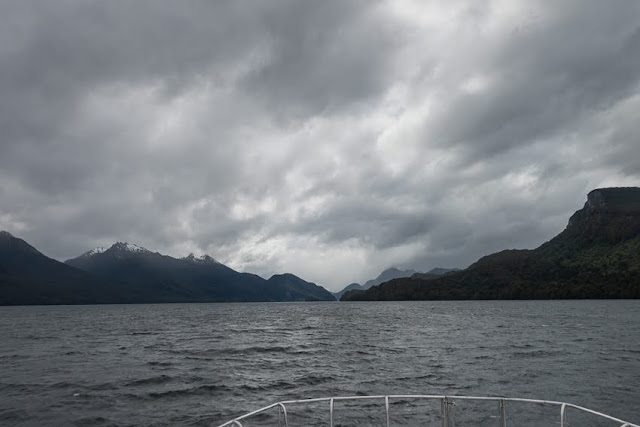 Back in Te Anau I check in to the YHA Hostel and plan my next tramp.